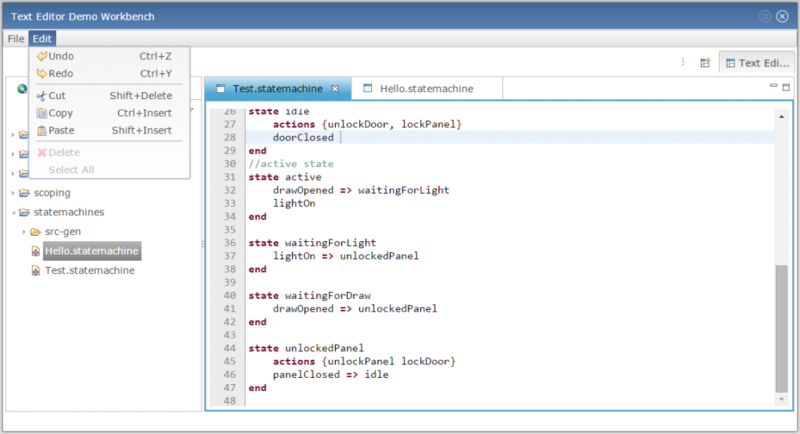 Follow this tutorial to get an Eclipse RAP web application with ACE/ANTLR running in the front-end, and Xtext in the backend. 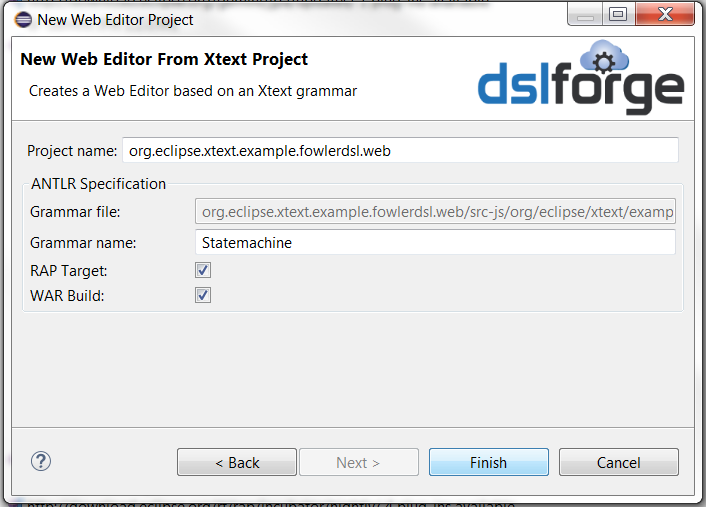 To run the web editor on Eclipse RAP, you need to change the target platform. A target platform is a file which contains a set of URLs pointing to different update sites. When you open a target platform file (.target), the Eclipse provisioning system, P2, takes care of downloading the dependencies. You should however wait for a while, go take a coffee! Wait until the list of sites expand like this. This process is done the first time, then P2 loads the plugins from its cache. You can export the plugins to your file system and use it offline. 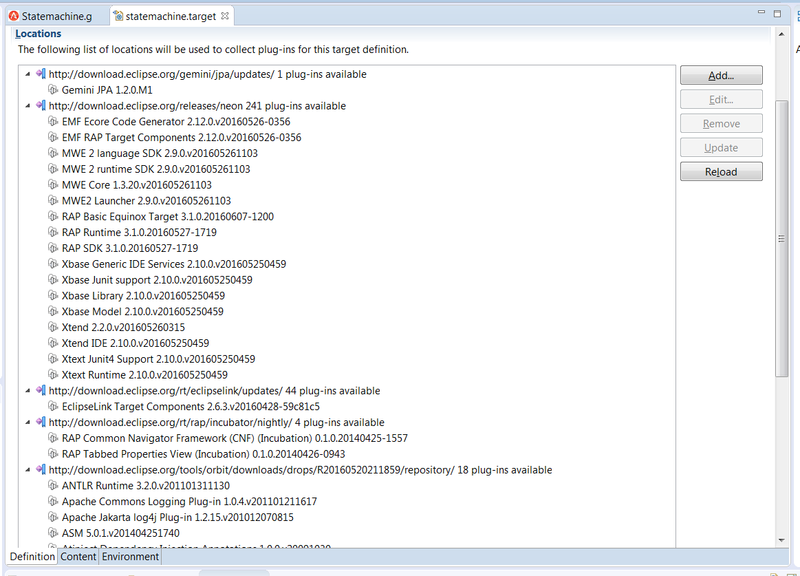 To swich between targets, use Preferences>Plugin Development>Target Platform, the current target is marked as “Active”. Select Running Platform to get back to the default target. Right click on the file then click on “Run as>Mwe2 Workflow”. 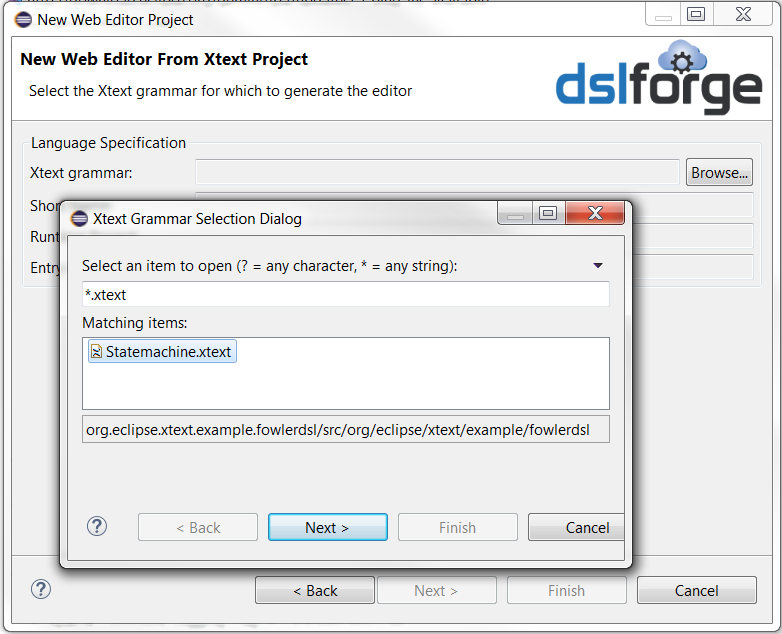 You should now have the Xtext artefacts generated in both projects; you can already create a runtime Eclipse configuration, create a general project, then create some DSL files (right click from the newly create project, select New>File, enter a file name with “statemachine” as extension, and actually play with the Statemachine RCP editor. 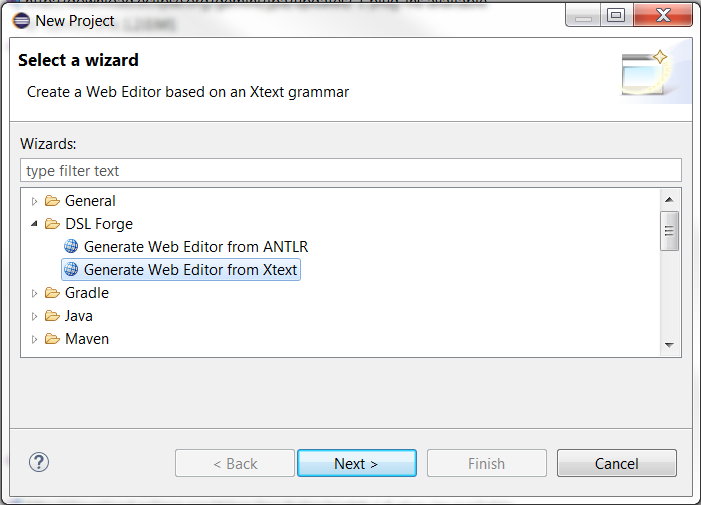 Here are the steps to get the web artefacts: In Eclipse, select New > Project, select “Generate Web Editor from Xtext”, click next, load the Xtext grammar, and click finish. double click on the target definition file, and wait until the target is resolved. click on “Set as Target Platform” and you’re done. When you switch to the Runtime target, the Xtext UI plugin does not compile, which is normal: the plugin has dependencies to Eclipse UI no longer resolved (you may also remove the dependency to org.eclipse.emf.mwe2.launch plugin in eclipse.xtext.example.fowlerdsl to fix possible compilation issues against the RAP target). The Java packages contain mainly the web editor, the language-specific text widget, the runtime Guice binding module, and the standalone setup. 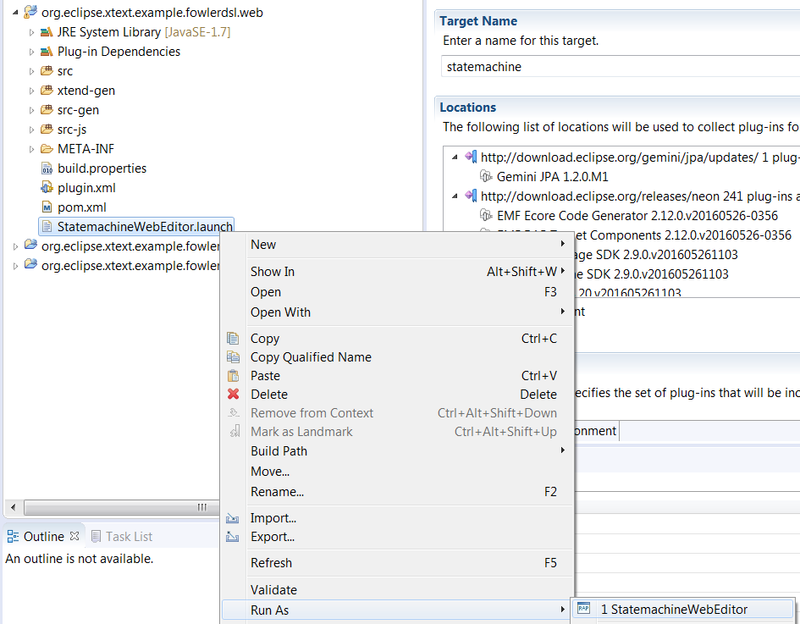 Report to Customize the editor for a detailed description of the src and the src-gen packages. theme : contains the CSS theme of the editor. In the src-js/*.web.ace.snippets, there is the templates file loaded by ACE Language Tools module, so that the templates appear in the content assist popup. ANTLR Parser Generator Version 3.3 Nov 30, 2010 12:50:56. A launch configuration is already generated inside the web plugin, simply right click on the launch file and select Run as > StatemachineWebEditor. 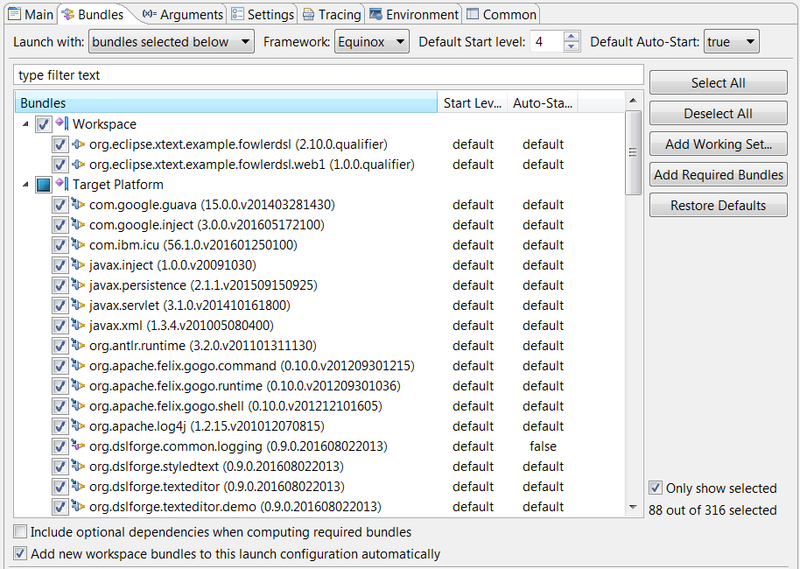 In Eclipse, under Debug Configuration, run as a RAP Application, then Open in External Web browser. In the Text Editor Demo, the servlet path is /texteditor. Adjust the plugins start levels. The workspace plugin start level should be higher than the persistency unit start level, which is in turn higher than gemini.jpa start level. For example, if the default level is 4, than make sure the following order is respected. Click “Debug” now, you should have the workbench demo running with your DSL and its Xtext features (validation, code generation, content assist) already integrated with the workspace, menus, wizards, etc. Welcome on board! Validated on Chrome, Firefox and Safari. Jetty is preferred in Eclipse/OSGI environments. For J2EE environments, the editors can be deployed using Maven, Tycho and Jenkins on classical servlet containers (Apache Tomcat); the Equinox Servlet Bridge component being packaged with the war bundle, allows translating network requests between OSGI and the Servlet Container. Contact the support for more information about “real world” servers deployment.